Following the successful “shaping” of a new business pursuit by the Business Development and Capture Management leads, it’s up to the Proposal Team to shred the customer’s Request for Proposals (RFP) and get to work. This is no easy task—experience, skill, instinct, and intuition all play a part in how a successful Proposal Manger approaches an engagement. Analyzing sections L, M, and the Statement of Work (SOW) … developing a realistic proposal and production schedule … creating an air-tight compliance matrix … crafting questions for submittal in response to ambiguous government RFP directions … determining how best to motivate the proposal team—particularly the Writers … coordinating the efforts of the writers, reviewers, graphic artists, formatting and production personnel, and ensuring the proposal is delivered on time is one of the most stressful endeavors on Planet Earth, but BluEdge prop Managers have “been there, done that,” and are ready to do it again on your behalf—always focused on nothing short of a WIN!!! BluEdge proposal professionals can apply their skills, talents, and abilities in strict compliance with your expectations and organizational capabilities. They can follow as many (or as few of!) the “industry standard 96-steps” as you wish—or they can integrate into your own standardized proposal process. No process?! No worries!! We can help you develop a standardized, repeatable proposal process that works for your business. Short on space?! No problem! Our Proposal Support Specialists are experienced with all of the popular collaborative proposal enabling software applications—SharePoint, Privia, and others—that enable proposal personnel (your and ours) to work remotely without compromising version control. At the stage where you’re ready to expand your own internal proposal development capabilities? Terrific!! We can help you design a proposal center and associated hardware/software necessary to get you off to a great start. 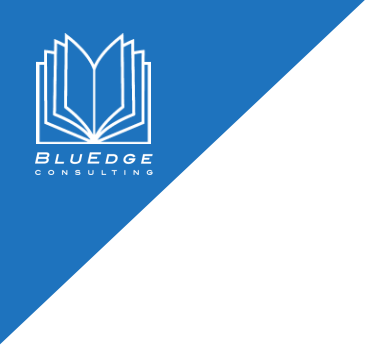 In addition to managing the proposal process, BluEdge can provide you with the entire spectrum of skills and “LCATs” necessary to take your proposal effort from kick-off to submittal: Managers, Coordinators, “Solutioneers,” Tech Writers, Volume Leads, Graphic Artists , Editors, and Desktop Publishers—many of which have Top Secret security clearances with additional accesses. Let our proposal professionals give your next proposal submittal the Blu Edge over your competition!! !